If you think you have what it takes to follow a dietary plan that’s based on eating like our ancestors, Paleo meal delivery services can help you make the most of such an eating program, using the healthiest ingredients available and preparing the tastiest foods for you. These 10 Paleo meal delivery services will change your life forever. Freshly seeks inspiration in the Paleo diet and creates meals that are rich in protein and made with all-natural ingredients. Pick a meal plan that fits your schedule and enjoy the variety. The Good Kitchen offers excellent Paleo meals made of 100% clean, organic, and sustainably sourced ingredients. Choose from a variety of meal plans and enjoy great customization options. Looking to go back to the roots and eat just the most basic, natural ingredients? Home Bistro offers a great tasting paleo program that consists mainly of meat, fish, vegetables and fruit. 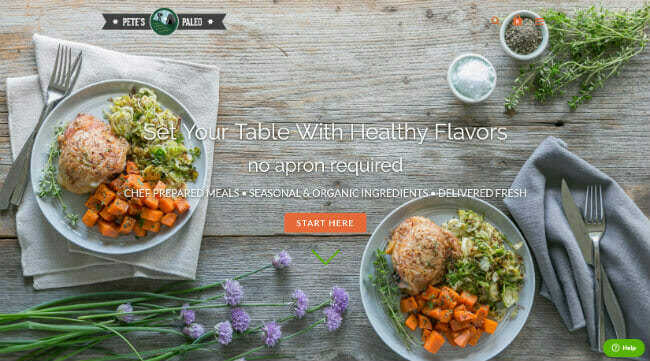 True Fare features a rich selection of chef-created Paleo meals that you can purchase individually or within one of its many subscription plans. All meals are whole30-approved. Based on the 22-day challenge, 22 Days Nutrition delivers fresh, wholesome foods directly to your home, allowing you to enjoy delicious, good-for-you meals on a weekly basis. Pete’s Paleo is a meal delivery service that specializes in the Paleo diet. Apart from amazing weekly menus, it offers meals for special Paleo programs, as well as its own bone broth and bacon. Trifecta Nutrition knows that going Paleo requires time and dedication. Its skillful chefs make new menus every week, letting you enjoy tasty and healthy Paleo dishes with minimum effort. Paleo On The Go is a meal delivery service dedicated to delivering delicious, healthy and creative Paleo meals right to your door. Start eating Paleo and watch your health improve every day. At Beetnik Foods, you can purchase amazing, certified organic Paleo meals individually or within the special Paleo Variety Pack. Order anytime, as many meals as you want, without a subscription. Eatology Paleo Zone just found a way to make Paleo even healthier. Combined with the benefits of Zone eating, these delicious Paleo Zone meals are sure to keep your body in perfect shape. The Paleo diet is one of the healthiest dietary plans ever. This program guarantees a cleaner diet without any preservatives, additives or dangerous chemicals. You can also experience numerous anti-inflammatory benefits from the nutrients in oils, seeds, nuts, fruits, and vegetables. Red meat, on the other hand, guarantees a steady intake of iron. People usually give up on their diet programs due to the prevailing feeling of hunger that overpowers their will to eat healthily and lose weight. Let’s be honest, there isn’t a single person out there who never gave in to carb cravings at some point. The Paleo diet resolves this problem by increasing your intake of protein and fats, thus providing you with improved satiety between meals. On the other hand, we have the inherent benefits of meal delivery services. First of all, these companies will eliminate cooking altogether from your daily schedule. They will also save you countless trips to your local grocery stores and allow you to eat fresh and organic meals with documented origins of all the ingredients. In other words, you’ll save a ton of time and know exactly what you put on your plate every day. The Paleo diet can get pretty expensive if you buy all the ingredients on your own. Paleo meal delivery services, however, have standing partnerships with local sustainable suppliers, which enables them to offer lower prices, so apart from saving time and knowing where your food comes from, you’ll also save a ton of money. Paleo meal delivery services are incredibly convenient if you’re trying to maintain a healthy lifestyle while balancing work, kids, and many other challenges of the modern way of life. The companies are very flexible and their services are designed to suit your personal needs and preferences. You can pick your favorite ready-to-eat Paleo dishes from their impressive weekly menus and customize your delivery further by consulting the a la carte menu (when available). You’ll be able to save a ton of time you would otherwise spend shopping for groceries, prepping, and measuring the ingredients, as well as preparing the meal itself. Bottom line, Paleo meal delivery services are incredibly convenient and allow you to maintain a perfect Paleo diet without “doing the time” in the kitchen. Renowned Paleo meal deliveries will also partner with reliable suppliers, which has two benefits for you. First, you’ll know exactly where your food is coming from since every company points out its partners on its official website. This is something you’ll never have if you shop for groceries at your local store. Secondly, you’ll be able to save a lot of money since meal deliveries can afford the luxury of offering meals below retail prices. All the top-ranked companies on our list have their proprietary kitchens ran by professional and experienced chefs who will either create amazing and delicious recipes and prep the ingredients for you or cook fresh meals and send them to your home address. This makes Paleo meal deliveries a unique opportunity to eat restaurant-grade food every day without paying restaurant prices. The main goal of Top 10 Meal Delivery Services is to transform the overwhelming abundance of meal delivery options into a selection of risk-free choices handpicked by a team of experts with years of experience in sampling and reviewing meal delivery services. Trying out every single meal delivery service on the market is a process that requires a lot of time and money. Unfortunately, it can also leave you feeling disappointed or even angry more than once. In order to save you the trouble, our experienced team has singled out the best services in the country and written honest reviews of their offers, letting you know exactly what you can expect. When choosing the best meal delivery service, we pay close attention to every aspect that can be relevant to you as a customer. First, we research the meal options every company has to offer. That means that we determine whether it can accommodate the individual needs of its users. The highest-rated services usually have vegetarian, vegan, gluten-free, and/or Paleo options, offer you the possibility to customize your order in accordance with your dietary preferences, so you could avoid the ingredients you are allergic to or simply dislike, and let you choose between meal plans that are designed to suit different lifestyles. Variety is another highly important quality in meal delivery services. Some of them offer limited menus that are rarely changed. Others introduce rotating menus with new dishes available every week. That way, even if you order from the same meal delivery service every week, you get to eat the same dishes only several times a year. These are the services that receive the best rating. We also take a good look at the nutritional value of the meals. Of course, you want your meals to taste good, but what may be of even greater importance is whether the meals you eat provide you with the optimal amount of all the major nutrients. In our book, only a healthy, balanced, and delicious meal is a meal worthy of recommendation. We are rather careful when rating meal delivery services in regard to portion size, as this feature is highly subjective. What may seem small to one person may appear ample to someone else. This is why we analyze this feature in conjunction with the one previously mentioned. That means that we consider portion size to be sufficient if it provides you with enough nutrients and energy to complete your daily tasks with ease and keep you feeling full for hours, without feeling the need to snack between meals. Although the quality of food is paramount, we also rate meal delivery services based on their prices and flexibility. In order for it to receive high rating, the service needs to be affordable, with no hidden costs (clearly stated shipping costs and additional fees, preferably offering free shipping), and flexible in terms of subscription, allowing you to cancel your subscription or skip an order at any time, no penalties, no questions asked. The following price comparison is designed to help you easily figure out which of our top-ranked Paleo meal delivery services best fits your budget. We have brought all the pricing information to one place, including the shipping costs and details about the companies’ delivery areas, so you can identify the perfect fit in a single glance. What all of our top picks have in common is that they are currently the best on the market. Now it is time to discover what makes each of these Paleo meal delivery services unique. Explore their distinctive features in the mini-reviews below and choose the one that best satisfies your personal needs. 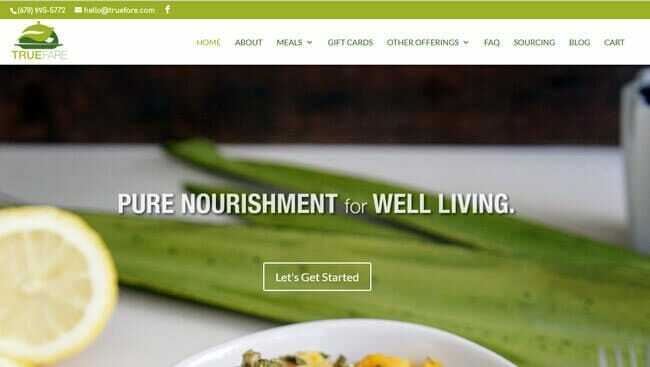 Freshly is one of the best meal deliveries that adheres to the principles of the Paleo diet. Its delicious cuisine is primarily built around protein sources and certain vegetables without any artificial additives, processed sugars, and gluten. The meals often include organic ingredients and the company tries to make the dishes as natural and clean as possible by using proven local sources and excluding any artificial ingredients. If you’re interested in the Paleo diet, Freshly is definitely the way to go. The Good Kitchen offers high-quality, Paleo-friendly meal options without any processed products, additives, preservatives or added sugars. The food is prepared by professional chefs from organic, sustainably sourced ingredients and contains no GMO whatsoever; not to mention that it tastes delicious. The company separates its meal options into 2 categories – adults and kids, with 4 dedicated programs in each. You can order The Good Kitchen meals even if you live in Alaska or Hawaii. 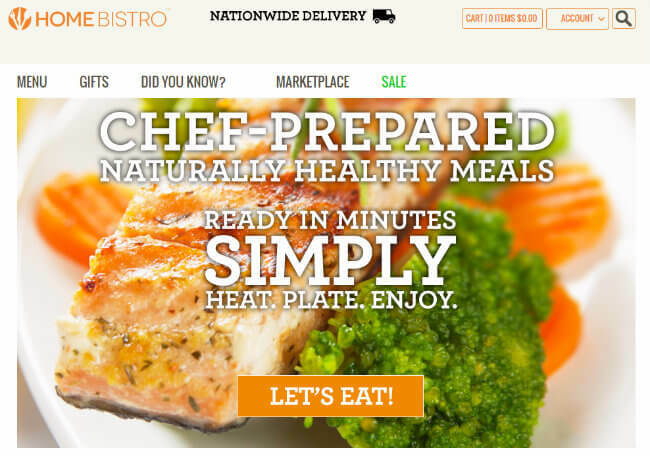 Home Bistro is a meal delivery service that brings the finest tasting cuisine right to your door. The best possible ingredients taken from animal-friendly farms and hand-picked for every meal are transformed into restaurant-grade delicacies. With its Paleo options, you can enjoy meals that completely exclude dairy or grain products and processed food. You can either choose pre-existing entrees from the Paleo section of the menu or you can order the ingredients and cook for yourself. Pre-Made Paleo, now known as True Fare, is definitely one of the best Paleo meal delivery services on the market with a program created by Chef Richard Bradford. All meals are Whole30-approved, which means they strictly follow the Paleo eating regimen. All meats are grass-fed, vegetables are 100% organic, and all the food is locally sourced from trusted providers. Pre-Made Paleo delivers to all 50 states in the US, as well as Canada and Puerto Rico. 22 Days Nutrition is a vegan meal delivery service launched by Beyoncé and her trainer Marco Borges. The company dishes out 100% organic, soy-free, and gluten-free vegan meals to your home address to guide you toward a healthier lifestyle. Note that the company doesn’t offer pre-portioned ingredients with appropriate recipe cards but ready-to-eat meals created by some of the biggest professionals in the business. Pete’s Paleo is a renowned meal delivery service, and for a good reason. The company is Paleo certified and offers documented origins of its food. Also, any sweetening of provided meals is done via fruits and vegetables, avoiding honey and maple syrup. All of the ingredients are organic, seasonal (where applicable), and absolutely GMO-free. The company features numerous meal programs, including Wahls Protocol, 21 Day Sugar Detox Plan, and many other plans. 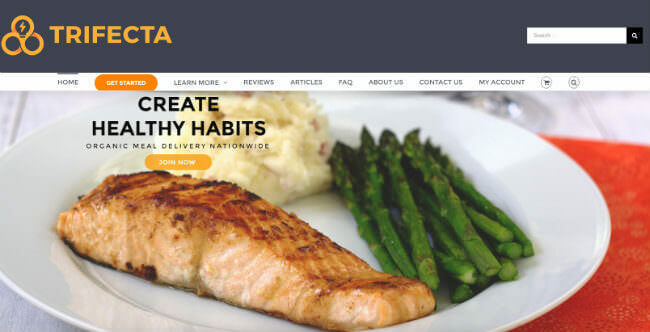 The Trifecta Nutrition meal delivery service is designed to help its customers eat healthy without having to worry about grocery shopping, cooking, and planning their meals. It only uses fresh, organic produce and takes care of your daily intake of macro and micronutrients. Its meals are carefully planned, low in calories, and rich in fibers in order to prevent you from feeling the need to snack between meals. Paleo On The Go is yet another highly popular meal delivery service dedicated to the Paleo diet. The company’s kitchen is absolutely gluten-free, certified Paleo and certified Paleo-friendly. The produce used is 100% organic, the meats are all pasture-raised, and the meals are cooked in high-quality oils. When it comes to meal choices, the company offers a wide range of options, including its proprietary bacon and bone broth and many other delicacies. Beetnik Foods is a certified Paleo-friendly meal delivery service that offers a multitude of high-quality nutritional choices to its customers. The company offers non-Paleo foods as well, so make sure your order is marked “Paleo-friendly” during check-out. Beetnik Foods offers USDA certified organic produce and antibiotic and hormone-free meats. Its products are also available in health food stores across the nation, so you might even find them in your local store. Eatology is a unique meal delivery service in that it provides Paleo options but also primal meals and options dictated by the Zone diet. This translates to balanced meals that encourage a favorable hormonal response from your body. All meals feature a well-balanced ratio of fats, proteins, and carbs and can be ordered in different sizes, even allowing you to make dietary decisions guided by the Zone blocks. The food is 100% soy, dairy, and gluten-free.